So what is software multi-tenancy? In general is the software architecture where one application instance serves multiple clients, something quite common in SaaS solutions . I will not go into details regarding the pros and cons of multi-tenant architectures, but there is really nice presentation on the subject here and here and probably the most popular article on the subject from Microsoft (a bit dated but still relevant). 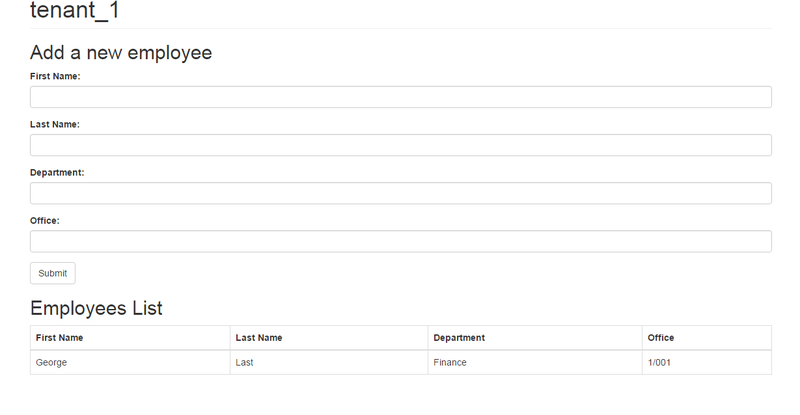 Shared schema : data for all tenants is stored in the same tables and are identified through a tenant discriminator column. Options 1 and 2 are probably the less intrusive for the application, provide the highest level of isolation and do not vary significant in terms of implementation. I will be using option 2 where the tenat id is going to be part of the URI mainly to make the client simpler but option 1 with custom http headers would not vary significanlty. Nice post on the subject here. Hibernate currently supports the Separate Databases and Separate Schema approaches with support for the Discriminator option planned for version 5 of the API. We are going to use the separate database approach, with this approach Hibernate requires you to specify a MultiTenantConnectionProvider. This is an interface you need to implement and will allow Hibernate to obtain connections in a tenant specific manner. Hibernate also requires you to implement the interface CurrentTenantIdentifierResolver , as this is the contract for Hibernate to able to resolve what the application considers the current tenant identifier. After this short introduction it is time to start STS and create a new Spring Starter Project from File -> New -> Spring Starter Project. In the Dependencies step select JPA, MySQL, Thymeleaf and Web click Finish and STS should download your template and import it to your workspace. For the purpose of the tutorial we are going to create a very basic app for storing employee records. Imagine a scenario where each tenant would be a separate company storing their employees data in your SaaS based system. To present an employee we need a domain class, a simple one will do for the purpose of our demo. We annotate our class with the relevant JPA annotations. As you can see below it is only a POJO that does not contain anything special with regards to multi-tenancy. 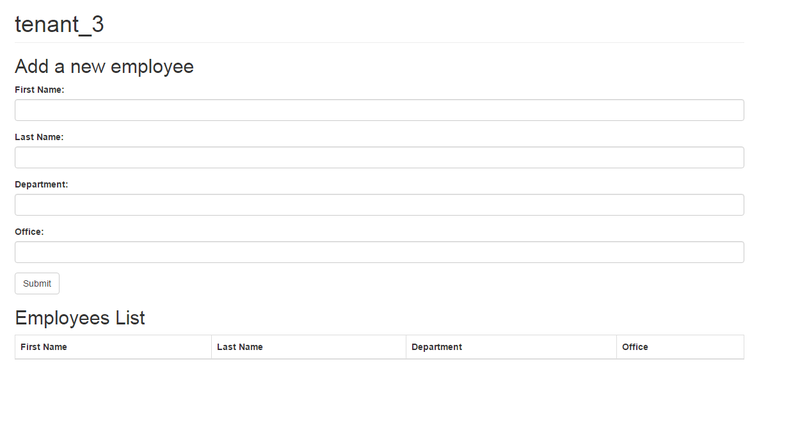 Creating a Repository for our Employee class is trivial using Spring. For our basic CRUD operations we only need to create an interface that extends Spring's own CrudRepository. Again nothing specific needs to be done here to support multi-tenancy. In order to identify the current identifier we will intercept the incoming request by using a handler interceptor. HandlerInterceptors are somehow similar to Servlet Filters. Spring provides an abstract class (HandlerInterceptorAdapter) which contains a simplified implementation of the HandlerInterceptor interface for pre-only/post-only interceptors. In our case we are only interested on intercepting the request before it reaches the controller in order to identify the tenant, so we will only override the preHandle method. The tenant ID is going to be a path variable and we are going to retrieve it and add it as an attribute to the incoming request before this is processed by the controller. Later you will how this is picked-up by our CurrentTenantIdentifierResolver. The implementation of the CurrentTenantIdentifierResolver is also pretty straightforward. We will retrieve the tenantid request attribute from Spring MVC RequestContextHolder and provide it to Hibernate (this is the tenantid we added in our interceptor). Our implementation of the MultiTenantConnectionProvider is also quite simple, we extend the AbstractDataSourceBasedMultiTenantConnectionProviderImpl provided by Hibernate, we let Spring inject our datasources, load them in a map and resolve the datasource based on the tenantIdentifier. In terms of configuration there are a couple of things we need to do. 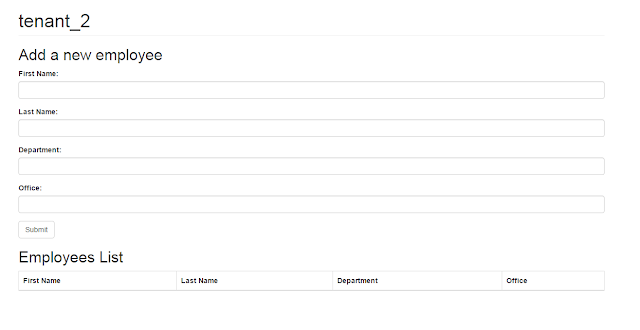 First we need to add our interceptor to Spring's MVC InterceptorRegistry. To do that we extend the abstract class provided by Spring WebMvcConfigurerAdapter and override the addInterceptors method. It is probably a good idea to externalise the configuration for our datasources so we will use the @Configuration annotation and Spring will validate and bind the datasources from application.properties. For the demo we are going to define 3 datasources. Now that our backend is pretty much ready let's create a couple of controllers to handle the index page and a form to add employees to our application. Next we create the controller which is going to handle the requests for adding a new employee and retrieving the list of the existing employees for the current tenant. You will notice that in the employees method we have included the tenantid path variable, this is not required and it is there so that we can reference it in our html. 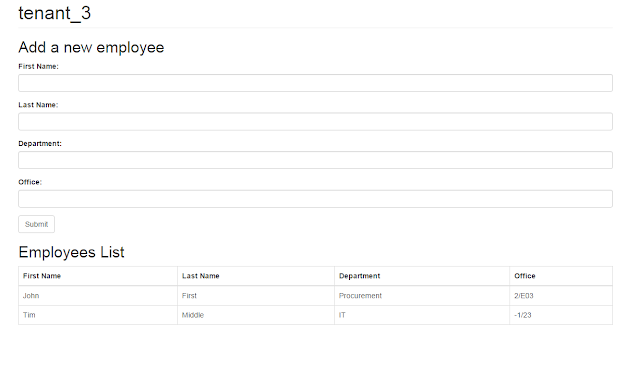 We also add an Employee instance to our model for the form. The addEmployee method is also very simple simple, saves the employee instance to our database and redirects to the current page. Clicking any of the tenant links navigates to the form to add a new employee. Notice the tenant identifier in the URI and the html. We can try out our form to add a new employee to the current tenant. If everything works well clicking the Submit should add the employee to the database of the current tenant. You can confirm this by navigating again to the form using a different tenant identifier. 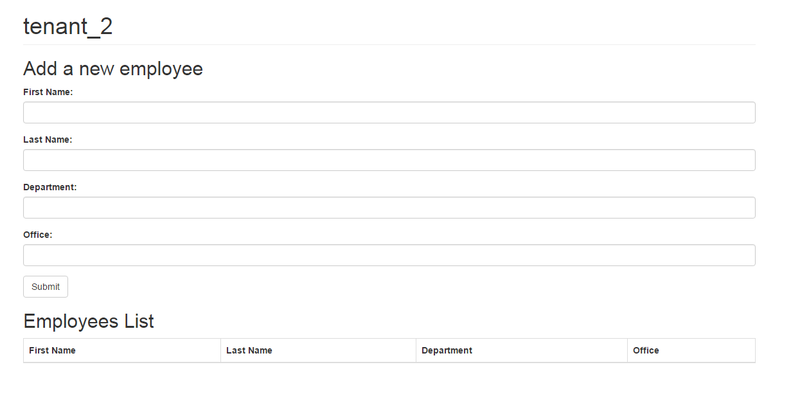 You can again check that these have been added to the correct database by using the different tenant identifiers. Very nice tutorial. If i have all 3 tenant information in default database instead of application.properties file, how can i make the database connection? Do you mean one database with different schemas or different tables? I asked about dynamic datasource in separate databases approach. For ex, I have many database(default_db,tenant_1,tenant_2,tenant_3,tenant_4, etc....). I stored database name(tenant_1,tenant_2,tenant_3,tenant_4, etc....), username and password in one table on default_db. I know it's an old post but I have the same problem and would like to ask if you've found a way to keep tenants information in a default database? Great post! I was able to get this working. However, when I implemented multi-threading using ExecutorService - the new threads seemed to be getting the default values of the tenant identifier- for eg. tenant_1 in this case even though the api call was made using tenant_2. I am using ExecutorService for a bunch for inserts that happen in a multi-threaded manner - each insert being a new transaction. However, this fails with multi-tenancy. Anyone aware of this issue? This article was very helpful to me. Thank you for your work. Hi, nice and useful content you have made. Thanks for it, keep sharing! !